MOSCOW, December 23. /TASS/. Russian President Vladimir Putin said on Tuesday Russia, Belarus and Kazakhstan would sign a treaty on Kyrgyzstan’s joining the Eurasian Economic Union. 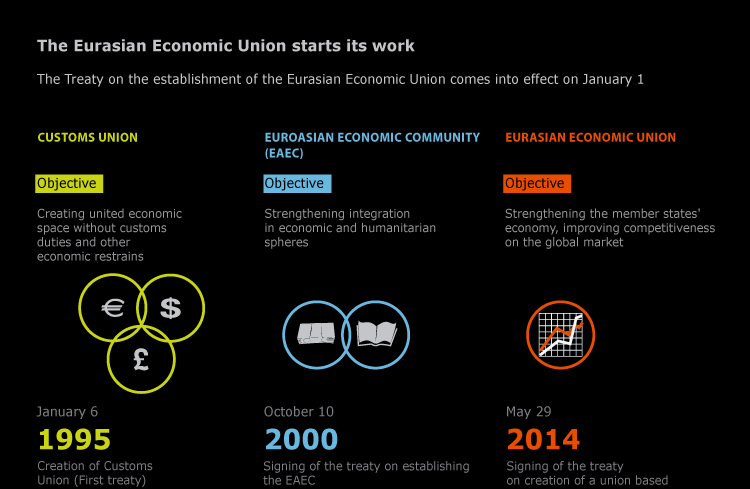 “Today we’ll sign the treaty on Kyrgyzstan’s joining the Eurasian Economic Union. Our Kyrgyz friends together with the Eurasian Commission troika exert serious effort for the adaptation of national legislation to the requirements of the Customs Union and the common economic space. A big number of ‘roadmaps’ has been implemented. It is necessary to gain momentum and jointly complete the work,” Putin said at the EEC summit. The biggest association with a consumer market of more than 170 million people will come into existence on the post-Soviet space. The association will be guided by the norms and principles of the World Trade Organisation (WTO) and will ensure free movement of goods, services, capitals and labour force. Armenia will also join the EEC. Kyrgyzstan is expected to enter the union on May 1, 2015.